A resident of the 3500 block of North Racine yesterday became at least the eighth victim of a burglary spree that began in our neighborhood last Friday. Chicago police issued an alert to warn residents about the break-ins, which detectives said were committed by a prowler (or prowlers) who entered through open windows. CWB Chicago has learned, however, that police categorized at least three of the burglaries as "forcible entry," meaning that the offender broke through a window or door to get in. This map shows the approximate locations of eight burglaries known to have been reported since last Friday. 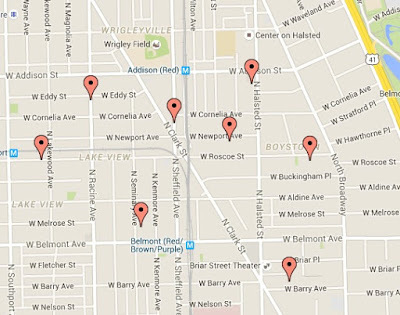 In addition to the usual things that burglars take, the victims on Seminary and Newport had their cars stolen, too. Also, a CWB Chicago reader who lives near Cornelia and Wilton told police that they found a screen cut out on one of their first floor windows this weekend. Fortunately for them, the burglar did not make entry.